"The Other Side," oil on wood, 48 x 36, 2016. The Other Side painting was created live on Halloween at a music venue called the Tin Cup in San Diego, CA. It started as a blank canvas and this vision of a woman with a hood in the full moon sky came to mind. The day of the dead is a cultural holiday in which the veil between the living and the passed is thin and almost transparent. It’s a time when people are said to be able to communicate with the other side and vice versa. In this painting It’s not clear whether the woman is alive or in spirit, but for me she’s got an intensity that feels like it’s from the other side. 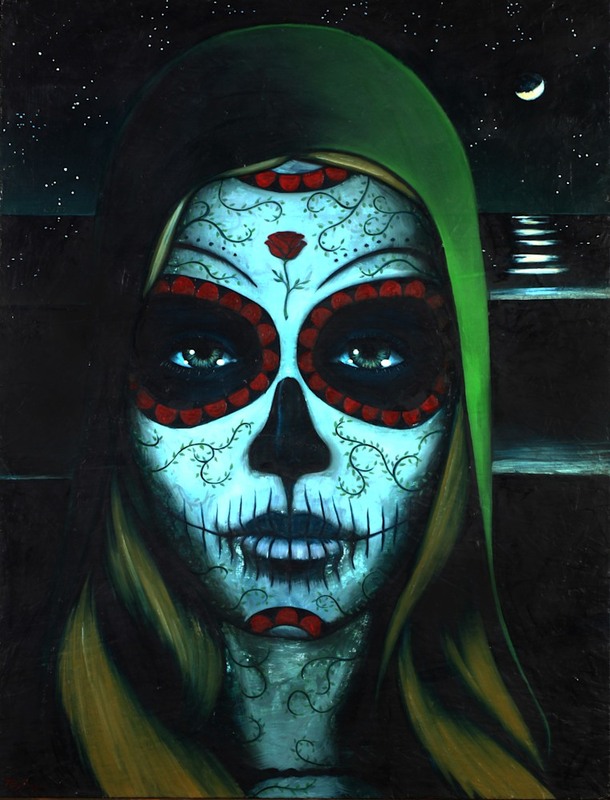 Surrealistic "Other Side" painting as fine art reproduction or original artwork by Southern California Artist, Taylor Gallegos.